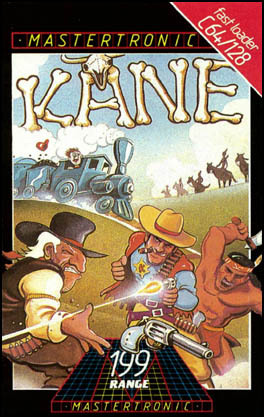 Designed and written for the Commodore 64 by John Darnell in 1985, with additional graphics by Nicole Baikaloff and Janet Porch. Converted for the Amstrad CPC and Sinclair ZX Spectrum by Simon Freeman. Conversion for the Acorn BBC Micro and Electron produced by Mike Woodbridge; no further credits are known. Also converted for the Commodore 16 and Plus/4, but no credits are known. All versions published by Mastertronic in 1986. 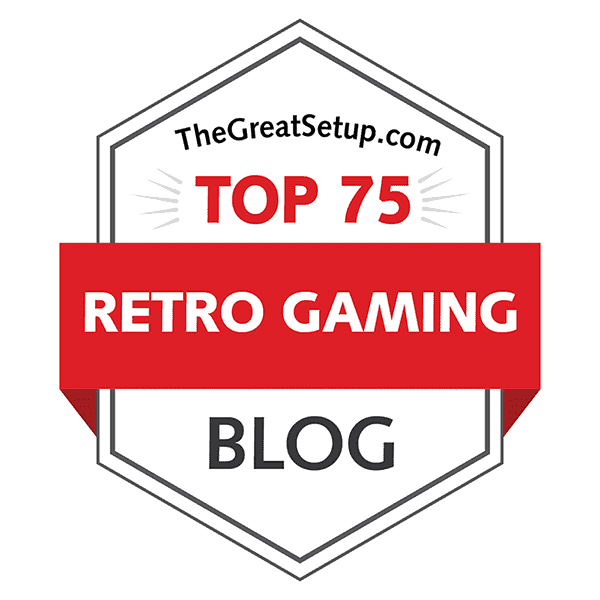 I thought this might be a good time to do a comparison of a game by the recently re-emerged John Darnell, whose work I shall be talking about after the main event. 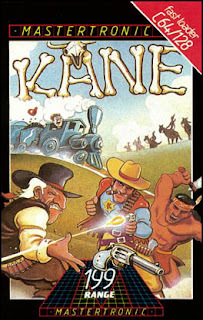 Kane was always one of my favourite games of his, although he has more ambitious games in his softography, and because I know a few of my C64'ing friends also have a soft spot for this particular game, it seemed like a good choice to end this month with. Written by Sampo Suvisaari for the MSX/SVI computers, and published by Teknopiste in 1986. Our timetravels today will take us back into 1985, which was when the Finnish computing wares importing company Teknopiste started publishing Finnish-made games, mainly for the MSX-compatible computers. One such case has already been dealt with earlier in the blog (Space Satellite), but today's game is the title that practically ended Teknopiste's run as a game publishing company, before the job of publishing Finnish MSX-games was more or less handed over to Triosoft. 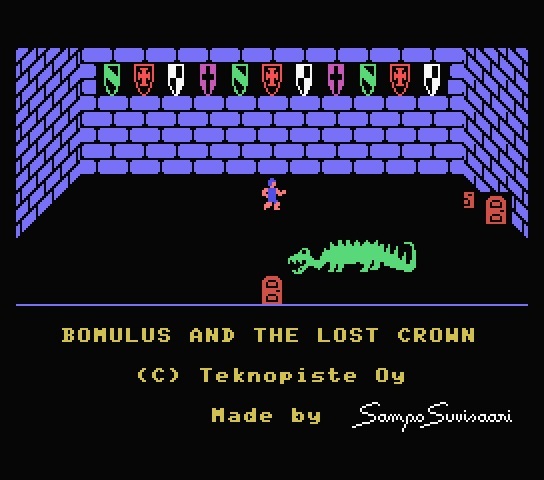 Bomulus and the Lost Crown is the final part in a trilogy of Bomulus games, but the first two games in the series, "Bomulus ja beduiinit" (translates literally to "Bomulus and the bedouines") and "Bomulus atomivakoojana" (translates more or less to "Bomulus the Nuclear Spy") are more difficult to find, so this is the only game in the series I am able to write about at the moment. Strangely enough, this is also the only game in the series, which uses English instead of Finnish for the displayed messages, supposedly in an attempt to get more international MSX gamers interested. This makes it all the more sad to say, that this shall be the last MSX game in the series, until more Finnish MSX/SVI games are found and/or digitized to an emulatable format... so let's make the best of it. Amstrad CPC, Atari ST, Commodore Amiga and Sinclair ZX Spectrum versions written by Kevin Parker, with graphics by Robin Chapman. Additional programming for the Commodore Amiga version by Nigel Edwards. Music for the Amstrad CPC version by Andy Severn and A. Brown. Commodore 64 version written by Andrew Challis. Graphics by Robin Chapman. Music by Keith "Howlin' Mad" Harvey. Apple ][ version written by Andrew Pines, based on the Commodore 64 version. IBM-PC version developed by Visionware, Inc: Programming by S. Chan and Robin Kar. Graphics by Robin Chapman and Matthew Crysdale. All of the above versions originally written in 1986, but published for the European market by Pandora, and for the North American market by Mindscape in 1987. Atari 8-bit version written by Kees Beekhuis, with graphics by Robin Chapman. Published by Atari Corporation in 1988. Unofficial conversion for the Commodore Plus/4 written by Mucsi, with additional graphics by Jeva. Released by Muffbusters in 1990. Previously on FRGCB: Sega tried to push themselves on the simultaneous four-player gaming market with something perhaps a bit too different from Atari's smash hit, Gauntlet. Today's entry takes the other path, and in a way, does Gauntlet in a single-player mode, and takes the action to World War II. Allegedly, Into the Eagle's Nest was heavily inspired by the movie "Where Eagles Dare", so naturally, I had to watch the movie for the first time in perhaps over 20, maybe even closer to 30 years. It's a great movie for its time, I have to admit, but I could only see some very basic resemblance in the game. 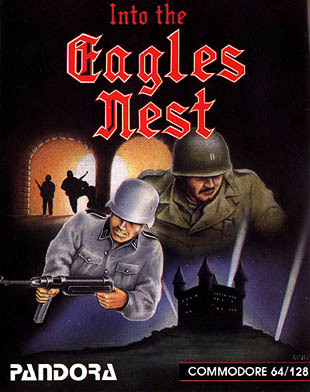 The movie's screenplay was written by Alistair MacLean, while doing a novel of it simultaneously, so perhaps there are some differences worth examining, but I have no time for it right now, nor do I believe the comparison between the book and the movie to be fruitful in connection to the game. And in any case, the game is the more important subject here, so let's get on with it.